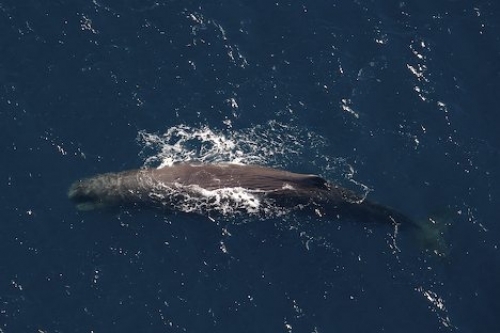 An aerial photo gives you a true picture of how big a Sperm Whale actually is. The whale watching flight of Wings Over Whales gave us the opportunity to get an aerial shot of this magnificent Sperm Whale resting in the waters off the South Island of New Zealand. A Sperm Whale rests by laying motionless on the surface of the water with a part of its head and dorsal fin or back partly out of the water and its tail hanging down. A Sperm Whale is often seen resting or logging and can be relatively easy to approach in this state. Once this whale decides to continue on his adventure watch for the single stream that can rise up to 50 feet in the air coming from his blowhole. You can see by this aerial photo why the Sperm Whale is the largest of the toothed animals throughout the world. The Sperm Whale is an amazing sea mammal to observe and do not miss out on the opportunity of a lifetime to go on a whale watching flight while in New Zealand. It is an excursion you will never forget, especially when you are flying overhead and you get an aerial view of this gigantic sized mammal.